This is the weapon presentation skill. 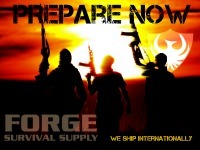 It is reinforced on the range with the live fire drill, Pistol 2. The start position for this drill is what we call position 3. There are so many names for this position it would almost be impossible to list them all here. For the sake of simplicity we call this "Position 3" because it is the third position in the draw stroke. 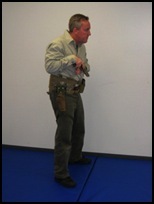 In the performance of the draw, this is the point at which the support hand meets up with the pistol and the two handed grip is established. "Ready 3," where the gun is oriented toward the target. "Safe 3," where the gun is oriented toward the ground. "Safe 3" has many other names too. It can be called "Position Sul," "Safe Gun," or any other name. For us, all of these are lumped together under Position 3. When standing at Position 3, you should be relaxed. The pistol does not need to be in the exact center of your chest, nor do both hands need to be firmly clenched together. The Shooter should, however maintain a body index point. Using this index point as a hinge will enable a quick and efficient presentation from 3 to 4. 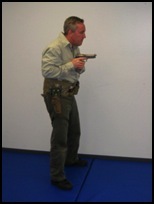 The movement of the weapon from Position 3 to Position 4 is the base on which all other pistol skills are built. The Draw is nothing more than 3 to 4 after clearing the holster. Turn and shoot is 3 to 4 during a facing movement. The 3 to 4 exercise, "dry fire" is the same as Pistol 2 in the Live Fire section. By practicing "dry" shooters can work on the shooting fundamentals. Sight Alignment: Start slowly and work on consciously acquiring the sights as the weapon is pushed out. Sight Picture: Always pick a point of aim when practicing. This will help orient your sight alignment. Trigger Control: Work on timing the shot to break when you want it to, during your presentation. Follow Through: Regain your sight picture after you have let the "shot" break. 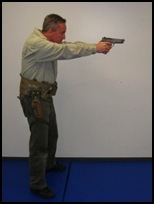 Shooters with double to single action pistols should not practice controlled pairs, double taps or multiple round engagements as a "dry" drill. Practicing those skills with a double to single action pistol will inadvertently reinforce coming off the trigger (or slapping) when the weapon changes to a single action mode during live fire.